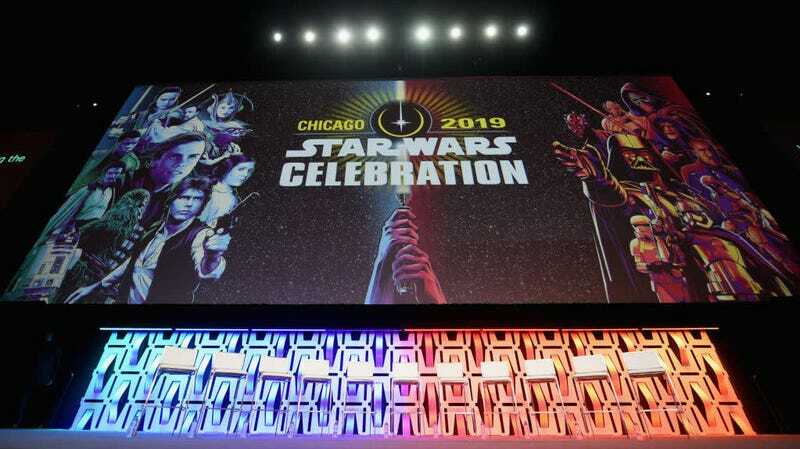 The Celebration Stage at Star Wars Celebration Chicago. Star Wars Celebration 2019 is in the books and it marked probably the biggest, most action-packed Celebration yet. It was the first convention to reveal a title for a Star Wars saga movie, the first time anyone saw footage of a live-action Star Wars TV show, and oh so much more. Below, are our 10 favorite things that happened at Star Wars Celebration Chicago. A few months back, I wrote about the best Star Wars title reveal ever, which was for Revenge of the Sith. In that article, I said nothing could top that unless Lucasfilm somehow waited until Celebration to reveal the title for Episode IX. Which, at the time, seemed far-fetched. Well, it did, and the company waited until the very last second of the Episode IX panel to do so. The lights went down and the world simultaneously saw not just our first glimpse of the final film of the Skywalker Saga, but learned that the title is The Rise of Skywalker. As excellent as the trailer itself is, that two or three seconds before the blue “Star Wars” logo expanded to reveal the title was one of the best edge-of-your-seat Star Wars moments ever. Then, as if it couldn’t get any better, it was immediately followed by the appearance of Ian McDiarmid in the room, seconds after we realized he was returning as the Emperor? Yeah, that was a moment. For as long as I can remember, George Lucas wanted to make a live-action Star Wars TV show. Rumors of it persisted for so long that it became one of those things you simply never thought was going to happen. But now it has. Thanks to Disney+, Jon Favreau, and Lucasfilm, The Mandalorian will be that first live-action Star Wars TV show, and the first real details were revealed at the convention. Predictably, those reveals were devoid of too many juicy details—but, when the livestream cameras were off, Favreau screened several minutes of footage for the fans in attendance and it was everything we hoped it would be. Visuals and sounds that feel appropriately Star Wars, with pacing that felt a little more friendly to the larger TV canvas. The Mandalorian has the potential to change how fans view Star Wars stories from now until forever. Not in the Star Wars Rebels timeline just yet, unfortunately—but the padawan of Anakin Skywalker is back in her original Clone Wars era. At Celebration, fans got their first glimpse at Ahsoka Tano after leaving the Jedi Order in The Clone Wars. It was a storyline that would have been told had the series concluded. But it didn’t. Now though, on Disney+, it will, and fans got a glimpse of Ahsoka trying to be a normal person on level 1313 of Coruscant as well as her return to the fight, and saw a Clone unit painting their helmets to match her markings. Seeing that scene, as well as the trailer, put tears into the eyes of fans of the show. Star Wars Resistance season two starts with a bang. While it was awesome to see footage from The Rise of Skywalker and The Mandalorian, everyone knew those were coming. What fans didn’t know was coming was a screening of the entire season two premiere of Star Wars Resistance, which won’t air for several more months. The episode picks up right where the season one finale left off and features our heroes almost entirely in zero gravity due to their ship being basically a wreck. There’s also an awesome Aliens reference. 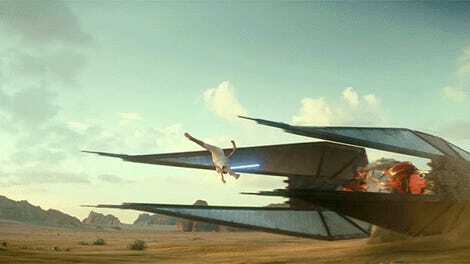 Of course, there were no answers on any big saga questions, otherwise it wouldn’t have screened this early. Still, any surprise at a convention like this is a good one. Star Wars fans love a good mystery and one of the biggest mysteries at Celebration was “Project Luminous.” Lucasfilm Publishing revealed the title, a 2020 release, and the fact it’s a joint collaboration between noted authors Claudia Gray, Daniel Jose Older, Cavan Scott, Justina Ireland, and Charles Soule. Is it one book? Many? Is it about a universe post-Rise of Skywalker? That last part seems probable but we’ll have to wait and see. George Lucas made six movies about Darth Vader, do we really need more information? Obviously, the answer is “yes.” Enter ILMxLab and Oculus, which are teaming up on a three-part, interactive VR story that’s set before A New Hope, titled Vader Immortal—the first episode of which is coming this year. In the game, you’re a Force-sensitive smuggler captured by Vader to find an item for him. And while we only played a few minutes of the first episode, it was incredibly cool to see a canon Star Wars story happening all around you, through your own eyes. Later this year, Star Wars fans get a new TV show, a new movie, and one more brand-new Jedi story set before the events of A New Hope. This one stars a Jedi padawan named Cal Kestis who survived Order 66 and is now in hiding—and best of all, you get a hand in his Cal’s fate. He’s the star of Star Wars: Jedi Fallen Order, a brand new one-player video game that takes fans through a whole new story with a whole new hero. Celebration revealed the first trailer and details for the game. With Kieron Gillen, Salvador Larocca, and Angel Unzueta’s time on the main Marvel Comics Star Wars series about to come to an end, questions have been circling for a while about who could be on the next creative team to take over the comic. At Celebration, we got some incredibly exciting confirmation on that front. Greg Pak—known for his work on the likes of The Incredible Hulk, Mech Cadet Yu, Hercules, and more—will write the series from issue #68, paired with art from the beloved designer Phil Noto, whose previous Star Wars work included the sumptuous interiors in the first half of the Poe Dameron series. Getting the perspective of a writer like Pak on the galaxy far, far away (he recently offered a very interesting examination of Grand Moff Tarkin’s psyche in the one-shot Age of Rebellion issue) alongside the stunning, painterly aesthetic of Noto—whose breathtaking preview work shown at Celebration elicited audible gasps from the audience—has us thinking the excellent streak the main Star Wars book has been on lately is going to continue to reach new highs. If you weren’t lucky enough to be in Chicago this year, Disney was once again nice enough to have a fairly extensive livestream happening each day thanks to the team behind The Star Wars Show. And while that was great for people outside, it was almost better for people inside. The “live” stage was massive this year and a true focal point for the convention. It was where people who didn’t get into panels could watch them comfortably and get incredibly close with the stars and creators behind their favorite Star Wars properties—closer even than the people who were in the panels. The moment “Kathleen Kennedy and Daisy Ridley Live Next” started flashing on the screen while I was on the floor, madness ensued with people rushing to get as close to the stage as possible. That type of unpredictability and accessibility truly sets Celebration apart. Star Wars Celebration will return to Anaheim, California in 2020. We’ll see you there.